THE NEWEST EAST RIVER SPAN: Unlike many bridges proposed by Robert Moses, the Throgs Neck Bridge was not part of the circumferential highway network proposed in 1929 by the Regional Plan Association (RPA). With the postwar era dawning, Moses proposed a series of new bridges and connecting expressways to meet anticipated growth in vehicular traffic. One proposal in his 1945 plan had a "Throgs Neck" span situated two miles east of the Bronx-Whitestone Bridge. Although Moses received a windfall from his Triborough Bridge and Tunnel Authority (TBTA), he needed additional Federal and state funds to fulfill his ambitious plans. Unlike his earlier arterial proposals, he received neither immediate funding nor unanimous support. The turning point came in the mid-1950's, when the Federal Bureau of Public Roads (BPR) expressed interest in building the Interstate highway system. Believing that he could obtain Federal and state funds for his arterial proposals, some of which had been shelved for years, Moses pitched a joint plan developed by the TBTA and the Port of New York Authority before the BPR. The recommended crossing would be a six-lane suspension bridge. The center of the structure would be 3,100 feet long and the side spans each 900 feet long. Including anchorages, the bridge would extend 5,200 feet. The low ground on both the Bronx and Queens sides of the East River calls for long approach viaducts - 3,900 feet long in the Bronx and 2,800 feet long in Queens. It is estimated that the Throgs Neck Bridge could be completed within three and one-half years after it is financed. According to the Joint Study, the Throgs Neck Bridge project would include construction of the Clearview and Throgs Neck expressways, and extensions of the Cross Bronx Expressway. By the time the Joint Study was released, nearby East River crossings were already operating at or above capacity. Annual traffic volume on the Triborough Bridge had exceeded 38 million vehicles, while that on the Bronx-Whitestone Bridge neared 30 million vehicles. After vigorous opposition from community groups on both sides of the East River, construction on the new bridge began in 1957. DESIGN AND CONSTRUCTION: Once again, Moses commissioned Othmar Ammann for bridge design work. In approaching the design of his first long-span suspension bridge since the Tacoma Narrows Bridge disaster, Ammann was fully aware of public fears about deck movement. For the Throgs Neck Bridge, he employed a more conservative design. In many respects, the design of the Throgs Neck Bridge is similar to that of the retrofitted Bronx-Whitestone Bridge two miles to the west. The Throgs Neck Bridge was designed with a 28-foot-deep stiffening truss. The raising of the deck began at each tower and proceeded simultaneously toward mid-span and the approach roads. The single-deck structure carries six lanes of vehicular traffic that rest on a series of laterally arranged transverse floor trusses. These transverse trusses are framed into two longitudinal stiffening trusses located in the vertical planes of the suspension cable. A lateral system of stiffening trusses between the top and bottom chords of the truss provides additional bracing. Together, the system of lateral, longitudinal and transverse trusses forms a rigid frame that offers sample resistance to load and wind forces. The concrete pavement rests atop this extensive truss system, providing motorists with unobstructed views of New York City and Long Island Sound. The two 3,205-foot-long suspension cables support the 1,800-foot main span and two 555-foot side spans (a truncation from the originally planned 3,100-foot main span and 900-foot side spans) some 142 feet over the East River. Each cable, which measures 23 inches in diameter, contains 37 strands of 296 galvanized steel wires. More than 13,000 miles of wire were used in the assembly of the cables. The anchorages of the Throgs Neck Bridge, like those of the nearby Bronx-Whitestone Bridge, are austere in design. Each of the concrete anchorages, which measure 140 feet wide by 200 feet long by 150 feet high, weighs approximately 170,000 tons. The approach viaducts to the Throgs Neck Bridge consist of continuous plate-girder spans carried on reinforced concrete piers. Sections of the approaches were constructed off-site in South Plainfield, New Jersey and shipped by rail to Jersey City before they were floated to the site by barge. The approaches consist of 12,357 tons of structural steel. Together, the bridge and approach roads form the shape of a "reverse S." On the Queens side, the TBTA moved 421 homes from the right-of-way of the Clearview Expressway to the site of the Bayside and Oakland golf courses. On the Bronx side, the TBTA obtained a right-of-way easement from SUNY-Maritime at Fort Schuyler in exchange for an adjacent landfill project on their property. Material dredged from the East River for the bridge footings was used for the new landfill. WAS THE THROGS NECK TOO SUCCESSFUL? The Throgs Neck Bridge opened to traffic on January 11, 1961. The bridge's $92 million construction cost was entirely financed by TBTA bonds, and its approach roads were financed under the Federal-aid Interstate highway system. Originally designated I-495 when it was in its planning stages, the bridge received the I-78 designation when it was under construction in December 1958. It did not receive the I-295 designation until 1971. The $92 million Throgs Neck Bridge, easing the flow of traffic in and out of Long Island, opened this morning, another evidence of the genius of "Big Bob the Builder" Moses. 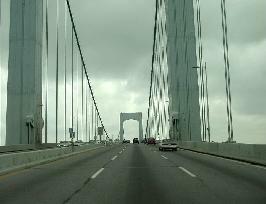 This structure, one of the handsomest suspension spans in the United States, links the Long Island Expressway and Grand Central Parkway with the New England Thruway, offers an alternative route to the New York Thruway, and through the Cross Bronx Expressway will shortly feed into the George Washington Bridge and the New Jersey Turnpike. It will be a blessing to Long Island and a vast relief to the whole metropolitan area. But Moses isn't content to pass one miracle. From the bridge dedication, the distinguished guests proceeded to Flushing Meadow Park to open the headquarters for the 1964 World's Fair, another Moses enterprise. The man is phenomenal. Long Island, where he started in the parkway business, is mighty proud to claim him, a resident and doer of good works. During 1962, its first full year of operation, the Throgs Neck Bridge carried approximately 63,000 vehicles per day. At the time, it was expected to take 16 million vehicles away from the Bronx-Whitestone Bridge. However, instead of relieving traffic, the new span ultimately increased traffic from the Bronx and points north to Queens and Long Island. One proposal from the early 1970s called for the construction of a new six-lane suspension bridge parallel to the existing Throgs Neck Bridge, similar to what was done at the Delaware Memorial Bridge. This proposal was scuttled amid concerns that hundreds of homes would have to be condemned for expanded roadways leading to a potential twin Throgs Neck Bridge. BUYING AMERICAN, AFTER PROTESTS: In the mid-1980s, the Throgs Neck Bridge was at the center of political controversy when the Metropolitan Transportation Authority (MTA) considered using South Korean steel to reconstruct the roadway. After a series of "Buy American" protests from union workers and supporters, the MTA instead purchased steel from domestic mills. This decision added $3 million to the $33 million cost of the roadway replacement. CURRENT AND FUTURE IMPROVEMENTS: According to the New York State Department of Transportation (NYSDOT), approximately 105,000 vehicles use the Throgs Neck Bridge each day. Most of this traffic is bound for Long Island points to the south, and for New England points to the north. The rising traffic volume on the Throgs Neck and Bronx-Whitestone bridges has prompted officials and business leaders to reconsider plans for a new bridge across Long Island Sound. In 1995, the interchange between the Queens approach of the Throgs Neck Bridge and the Cross Island Parkway was reconstructed. The $10 million interchange project was completed in only eight months. In 1998, MTA Bridges and Tunnels installed the first of its new variable message signs on the Throgs Neck Bridge. Eventually, variable message signs will be installed on other bridges and tunnels throughout the TBTA network. Between 2000 and 2004, MTA Bridges and Tunnels undertook a $23 million comprehensive rehabilitation project. This project included removing and replacing the concrete roadway and median barrier, repairing the orthotropic deck and structural steel, modifying expansion joints, replacing existing rocker bearings with more seismic-resistant ones, improving the drainage system, and rehabilitating the electrical systems. In 2002, MTA Bridges and Tunnels began a separate $10 million project to rehabilitate (or "rewrap") the main cables, and to replace the existing wooden pile "dolphin" systems with new "protective island" systems. The project was completed in 2004. HEAVY TRUCKS RESTRICTED TO OVERNIGHT HOURS: In 2005, MTA Bridges and Tunnels imposed a partial ban on heavy trucks (over 40 tons) crossing the Throgs Neck Bridge after 73 red-flag conditions - mostly cracking along steel floor beams on the 37 approach spans - were found on the bridge. The damage was found to be most severe away from the center median. An MTA engineer's report obtained by WABC-TV (Channel 7) found there was "a risk that cracking could lead to the loss of a floorbeam and the catastrophic collapse of a 191-foot-long span on the bridge approaches." A similar problem in the bridge's original steel floor beams was discovered in 1980, leading to the replacement of the roadway decks several years later. A 1983 Civil Engineering article said the failure of the original deck was "found to be due to secondary tensile and fatigue stresses brought on by deflection of the cantilever brackets supporting the decks under truck loading." Heavy trucks can cross the span only between 11:00 PM and 5:00 AM at a maximum speed of 30 MPH. A FIERY SCARE: On July 10, 2009, a three-alarm fire that started in scaffolding under a viaduct near the Queens shoreline closed the bridge for more than 12 hours. The scaffolding was erected in a repainting project and the intensity of the fire burned paint cans, protective netting, and the steel superstructure. Engineers determined that five of the six lanes (three Queens-bound and two Bronx-bound) were safe enough to reopen, but the right lane Bronx-bound and the northbound ramp from the Cross Island Parkway remained closed as they continued to assess the structural integrity of the fire-charred steel superstructure. Even as officials reopened the bridge, they kept it closed to all truck traffic for two months. SOURCES: Joint Study of Arterial Facilities; The Port of New York Authority-Triborough Bridge and Tunnel Authority (1955); "Throgs Neck Bridge Is Opening Today" by Robert Conley, The New York Times (1/11/1961); "Throgs Neck Bridge," Triborough Bridge and Tunnel Authority (1961); Arterial Progress 1959-1965, Triborough Bridge and Tunnel Authority (1965); Public Works: A Dangerous Trade by Robert Moses, McGraw-Hill (1970); Long Island Sound Crossing, Metropolitan Transportation Authority and New York State Department of Transportation (1972); The Power Broker by Robert A. Caro, Vintage Books-Random House (1974); The Bridges of New York by Sharon Reier, Quadrant Press (1977); "Throgs Neck Bridge: Why Did Its Deck Deteriorate?" by Benjamin Forsyth and Frank L. Stahl, Civil Engineering (July 1983); "MTA To Reconsider Buying Foreign Steel," The New York Times (9/01/1983); "Throgs Neck Bridge: 25 Years, 795 Million Vehicles," Newsday (1/12/1986); "Artists of the Archive," MTA Bridges and Tunnels Archives (January 1995); "Throggs With 2 G's Preferred By Pre-1960 Throggs Neckers" by Bill Twomey, The Bronx Times-Reporter (6/22/1995); Engineers of Dreams by Henry Petroski, Vintage Books-Random House (1995); "A Crossing Too Convenient for Its Own Good" by Robert Fresco, Newsday (11/25/1996); "A Guide to Civil Engineering Projects in and Around New York City," American Society of Civil Engineers (1997); "Throgs Neck Bridge Roadway Work Begins," Infrastructure News (November 1998); Six Bridges: The Legacy of Othmar H. Ammann by Darl Rastorfer, Yale University Press (2000); MTA Bridges and Tunnels Facilities, Harris Camden Terminal, Inc.; MTA Bridge and Tunnels (2000); "Truck Curb on Two Ailing Bridges" by Joe Mahoney, New York Daily News (6/09/2005); "Battle Over Truck Weights on Cracked Throgs Neck Bridge" by Peter Samuel, Toll Roads News (10/01/2005); "Throgs Nicked" by Victor Ross, The Queens Courier (10/05/2005); "Overweight Trucks Restricted on Throgs Neck Bridge," WINS-AM (8/09/2007); "Is the Throgs Neck Bridge Safe?" by Jim Hoffer, WABC-TV (2/26/2008); "Throgs Neck Bridge Fire Causes Commuter Chaos" by Wil Cruz, New York Daily News (7/10/2009); "Traffic Moving Again on Throgs Neck Bridge" by Emily Smith, WABC-TV (7/11/2009); New York Metropolitan Transportation Council; New York State Department of Transportation; New York State Dormitory Authority; Dave Frieder; Ralph Herman; Jeff Saltzman; Christof Spieler; Stephen Summers. Throgs Neck Bridge and I-295 shields by Ralph Herman. "No Trucks Permitted" sign by Richard C. Moeur.